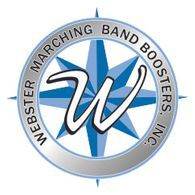 The Webster Marching Band Booster organization helps support the band both financially and motivationally. The Boosters include parents of current band members, parents of past band members, band alumni, and other interested people. The Boosters act as a team to support the band, Band Director, and Staff. The Webster Marching Band Boosters, Inc. is a registered, non-profit 501 (c)(3) organization led by an elected Board of Directors. The organization sponsors various fund-raising events to help pay for the band’s equipment, show production, and trip expenses. We are very grateful to the Webster community (including individuals, corporations, and other organizations) for their past donations. Booster meetings will be held several times over the course of a school year; about once a month. When you see a notice sent out that a Booster Meeting is to be held, sometimes referred to as a Booster/Parent meeting, and you have a son or daughter that is a member of the band, it is strongly advised you attend the meeting because of the important information that is communicated. The band director and each board member will provide a report. These booster meetings are also a great forum to get answers to any questions you may have. Topics discussed may include upcoming competitions, parades, fund raisers, and trip information. You may see a notice about a Board Meeting. These are intended for the Board of Directors of the Booster organization that were mentioned above. From time to time, parent representatives from various committees may be invited to provide updates to the board at a board meeting. In these cases, those representatives will receive a direct invitation from a member of the board.